The Symphony No. 8 in G major, Op. 88, B. 163, is a symphony by Antonín Dvořák, composed in 1889 at Vysoká u Příbramě, Bohemia, on the occasion of his election to the Bohemian Academy of Science, Literature and Arts. Dvořák conducted the premiere in Prague on 2 February 1890. In contrast to other symphonies of both the composer and the period, the music is cheerful and optimistic. It was originally published as Symphony No. 4. Dvořák composed and orchestrated the symphony within the two-and-a-half-month period from 26 August to 8 November 1889 at his summer resort in Vysoká u Příbramě, Bohemia. The score was composed on the occasion of his admission to Prague Academy and dedicated "To the Bohemian Academy of Emperor Franz Joseph for the Encouragement of Arts and Literature, in thanks for my election." Dvořák conducted the premiere in Prague on 2 February 1890. Dvořák tried to achieve a marked difference to his Symphony No. 7, a stormy romantic work. No. 8 would be: "different from the other symphonies, with individual thoughts worked out in a new way". The Eighth is cheery and lyrical and draws its inspiration more from the Bohemian folk music that Dvořák loved. The work is scored for 2 flutes (2nd doubling piccolo), 2 oboes (1st doubling cor anglais), 2 clarinets, 2 bassoons, 4 horns, 2 trumpets, 3 trombones, tuba, timpani, and strings. The orchestration of piccolo and cor anglais is unusual in this symphony. The piccolo only sustains a long note in unison with the flute at the exposition of the first movement and the cor anglais only plays a short, but exposed phrase during the second recapitulation of the main "bird call" theme, also in the first movement. In some editions the second oboe doubles on cor anglais rather than the 1st oboe as indicated in most scores. A typical performance of the symphony lasts about 36 minutes, making it one of Dvořák's shorter symphonies. Dvořák kept the typical format of a symphony in four movements, but structured them in an unusual way. All movements show a remarkable variety of themes, many of them based on Bohemian material. Occasionally the development of the themes seems like improvisation. The first movement is a powerful and glowing exposition characterized by liberal use of timpani. It opens with a lyrical G minor theme in the cellos, horns, clarinets and bassoon with trombones, violas and double basses pizzicato. This gives way to a "bird call" flute melody, reaching the symphony's key G major. Writing about a performance by the National Symphony Orchestra, Peter Laki notes that the development section "works up quite a storm." In the recapitulation, the second main theme is played by the English horn, two octaves lower than in the exposition. The movement ends with a "short but very energetic coda". Despite being marked Adagio, the second movement moves along at quite a reasonable speed. It begins with a typically beautiful clarinet duet and ends quietly, but contentedly. Similar to Beethoven's "Pastoral" Symphony, the music is inspired by the tranquil landscapes, depicting a summer's day, interrupted by a thunderstorm. 4. The movement is not the typical minuet or scherzo, but an "intermezzo" akin to the third movements of the First and Second Symphony by Brahms. In contrast to the "sweet and languid waltz" of the first theme, the second, "functioning as a 'trio,' sounds more like a Bohemian folk dance". The finale, formally a "complex theme-and-variations", is the most turbulent movement. It begins with a fanfare of trumpets. Conductor Rafael Kubelik said in a rehearsal: "Gentlemen, in Bohemia the trumpets never call to battle – they always call to the dance!" The music progresses to a beautiful melody which is first played by the cellos. The tension is masterfully built and finally released at approximately two minutes into the piece, with a cascade of instruments triumphantly playing the initial theme at a somewhat faster pace. A central contrasting episode is derived from the main theme. From there the movement compellingly progresses through a tempestuous middle section, modulating from major to minor several times throughout. After a return to the slow, lyrical section, the piece ends on a chromatic coda, in which brass and timpani are greatly prominent. Laki summarises: "Dvorák's handling of form is indebted to Beethoven and Brahms, but he filled out the form with melodies of an unmistakably Czech flavor and a joviality few composers at the time possessed. The variations vary widely in character: some are slower and some are faster in tempo, some are soft (such as the virtuosic one for solo flute), and some are noisy; most are in the major mode, though the central one, reminiscent of a village band, is in the minor. The music is always cheerful and optimistic." The composer conducted the orchestra of the National Theater in Prague in the first performance on 2 February 1890, as part of the concert 13. Populäres Konzert der Künstlerressource (13th popular concert of the artists' resource). After the successful premiere, he conducted the work again on 7 November 1890 in a Museumskonzert in Frankfurt and the following year in Cambridge, on the night before his being awarded an honorary doctorate. The symphony was performed several times by the Royal Philharmonic Society during his sixth trip to the United Kingdom. 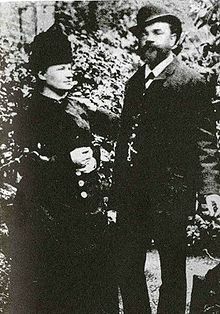 Dvořák had the London firm of Vincent Novello publish the symphony in 1890, because he had disagreements with his regular publisher Fritz Simrock, who was more interested in shorter works as moneymakers. Simrock wanted to publish the movement titles and the composer's name in German, which Dvořák refused as a "proud Bohemian". Because of the country of its first publication, this symphony has occasionally been known[where?] as the "English" symphony, though "it would be more correct to call it the 'Czech', at least in comparison with its predecessor in D minor which was modelled more on Brahms." ^ a b c d e f g h Schwartz, Elizabeth (2013). 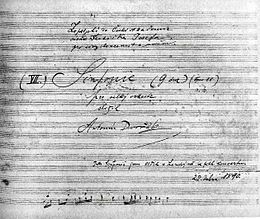 Dvořák's Eighth Symphony. Oregon Symphony, program notes. ^ a b Ostmann, Jürgen (2013). Von Themen und ihren Schicksalen (in German). Rheingau Musik Festival, program notes. ^ a b c d e Laki, Peter (2010). "Symphony No. 8 in G major, Op. 88". Kennedy Center, program notes for the National Symphony Orchestra. Retrieved 30 August 2013. ^ "PKF – Prague Philharmonia - Slovenská filharmónia". www.filharmonia.sk. ^ Paul Serotsky, "Antonin Dvorák (1841–1904) – Symphony No. 8" (Music Web International, 2010; accessed 9 January 2017). ^ "en/symphony8 - antonin-dvorak.cz". www.antonin-dvorak.cz. ^ a b Kurt Honolka, Dvořák, translated by Anne Wyburd (London: Haus Publishing Limited): 72. ISBN 1-904341-52-7 (accessed 9 January 2017). Annette Retinski, Alfred Beaujean, Harenberg Konzertführer: der Schlüssel zu 600 Werken von 200 Komponisten: mit 800 CD-Empfehlungen der "FonoForum"-Redaktion, fourth edition. Harenberg Kommunikation, Dortmund, 1998. ISBN 3-611-00535-5. Hansjürgen Schaefer: Konzertbuch Orchestermusik A-F. VEB Deutscher Verlag für Musik, Leipzig 1958.